Where in the World is AR Research Happening? This post provides a brief overview of where Augmented Reality (AR) research is happening in universities around the world. Academic Research in Augmented Reality arguably dates back to the 1960’s with Ivan Sutherland’s work at Harvard University on one of the first AR displays . Since that time the field has grown and now there are thousands of academics worldwide researching various aspects of AR technology and applications. If you are an student wanting to do a PhD in AR, or a company looking for help on a research project, it may be important for you to find where in the world AR research is being conducted. There are many ways to identify the best academics and universities doing Augmented Reality research. One method is to look at the number of research papers published by researchers in the field. In this post we use Scopus, an online database and indexing service, which provides links to most of the AR papers produced. Searching Scopus we can find that there have been over 19,800 research papers published with the term “Augmented Reality” in their title, abstract or collection of keywords. The first of these was Steve Feiner’s work on Knowedge-Based Augmented Reality , using a see-through head mounted display to superimpose virtual graphics over the real world to help in a training task. 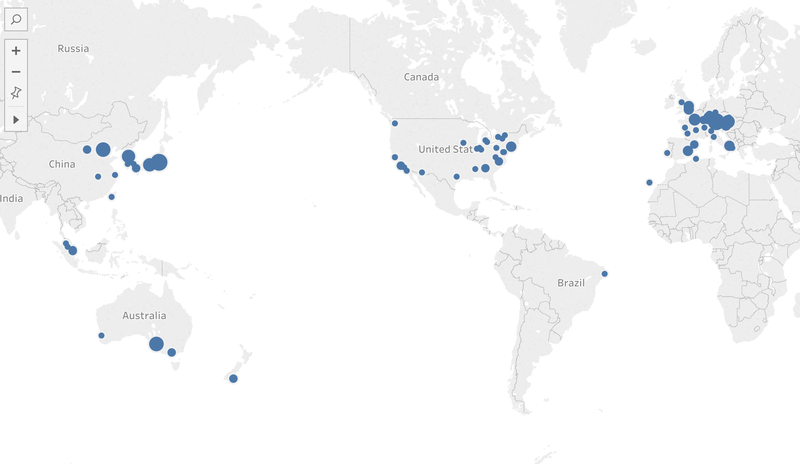 Scopus allows us to find the top 160 authors in AR and the institutions that they come from. This based on the number of publications produced by each author. The figure below shows a map of world with the locations of these authors plotted on it, with larger circles representing more researchers. The table below shows the breakdown of leading AR researchers per country, the number of universities and the ratio of researchers per university. 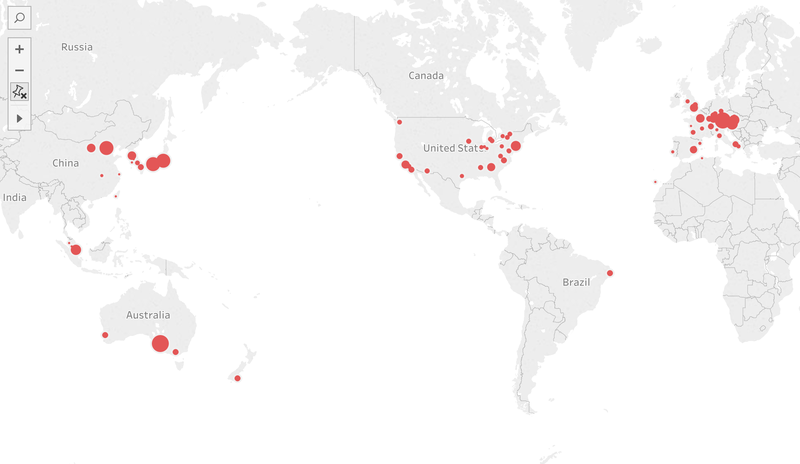 As can be seen, over half of the top AR researchers in the world are in the USA, Germany or Japan. There are a number of interesting things than can be learned from this. First of all, although there are a good number of top AR researchers in the USA, US institions with AR researchers typically just have 1–2 academics in the field from among the top 160 (average of 1.37). In contrast, in Asia, Europe and Australia there are larger clusters of AR researchers at fewer universities. For example there is an average of 3 world class AR researchers at the 3 Australian universities with top researchers. Unfortunately there are also very few strong AR researchers in South America, Africa, India, the Middle East, and Eastern Europe. We can also calculate the total number of papers that these researchers have published and plot them on a map of the world (see below). Not surprisingly the locations with the most academics also publish the most papers. The number of papers per institution can be easily found. The ten institutions with the largest number of published papers by the top 160 AR researchers are shown below, as well as the average number of publications per researcher at those institions. Interesting, the top nine institutions are all outside of the USA, showing the dominance of AR research in Europe, Asia and Australia. 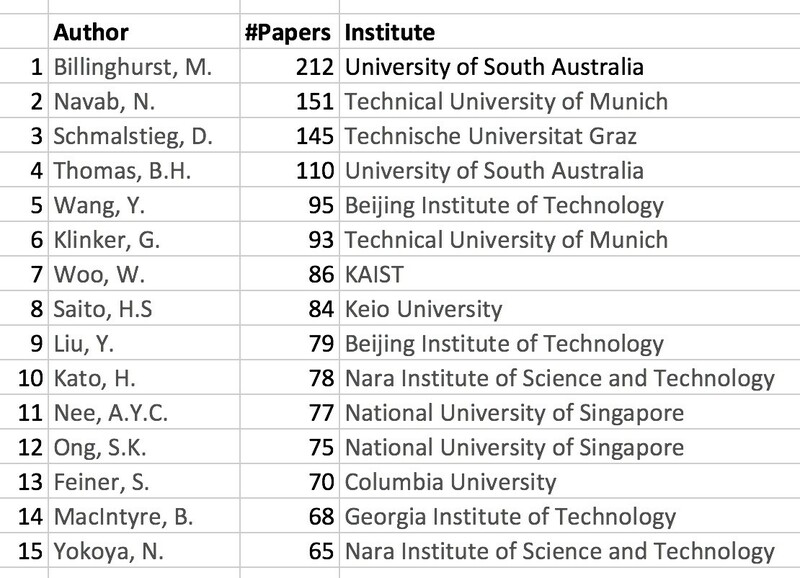 This of course is related to the publication record of the individual academics, so here is the list of the ten AR academic researchers publishing the most papers. This shows that there a number of star researchers, who publish a lot of papers in AR, even if their institution doesn’t appear on the top ten universities list. For example, Hideo Saito (Keio University), Blair MacIntyre (Georgia Tech.) and Steve Feiner (Columbia University), are all outstanding in the field. However, sometimes it’s not the number of papers that are published, but the impact of the research. This can be measured by the author’s h-index, a number associated with how many times their publications are cited. 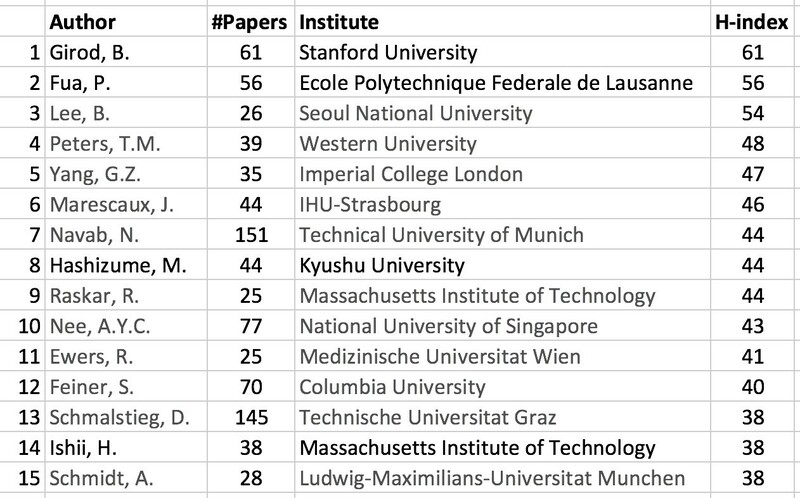 The table shows the top 15 AR academic researchers in the world by Scopus h-index. Nearly half of the researchers on this list come from European universities, with only four from the USA. In this post we’ve summarized where AR research is happening arond the World. As can be seen, most AR research in terms of publication output by top researhcers is happening outside the USA, in China, Japan, Europe and Australia. In these countries there are fewer universities doing AR research, but they tend to have a larger number of top AR researchers. However, there are still a number of star researchers doing great research by themselves at institutions in the US and elsewhere. However, there are a number of limitations with the analysis. First this is based entirely on Scopus data. Scopus captures journal publications of researchers, but may not be as accurate as Google Scholar in capturing the entire research output of a particular researcher. For example, Scopus lists Steve Feiner as having 70 AR publications (in May 2018) with an h-index of 40, but Google Scholar records him as having 463 outputs with an h-index of 74. However, Scopus is easier to use to get an list of top AR researchers. A second limitation is in the counting of AR publicatons per institution. Most publications have more than one author, and so some AR publications may be counted more than once, depending on the number of authors. I haven’t had time to check each publication for author overlap. Finally, this is a snapshot of AR academic reserach in May 2018, but the picture could change drammatically if some of the AR researchers moved around. 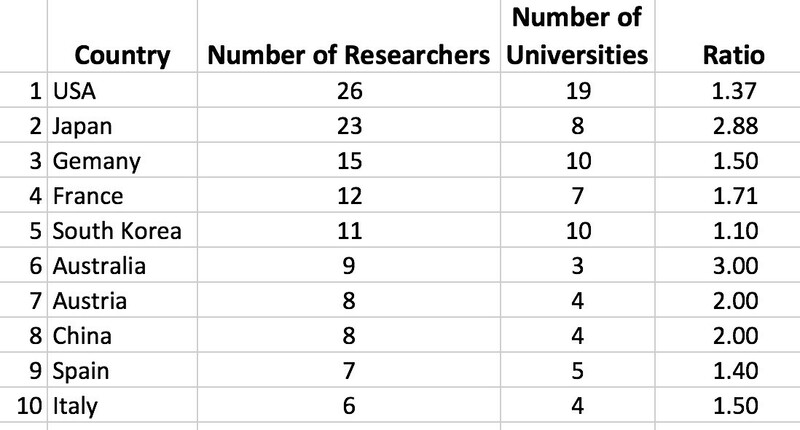 The numbers of top researchers at each university is relatively low (typically less than 4 or 5), so one researcher leaving for another institution could easily change the institution ranking in table 2. Sutherland, I. E. (1968, December). A head-mounted three dimensional display. In Proceedings of the December 9–11, 1968, fall joint computer conference, part I (pp. 757–764). ACM. Feiner, S., MacIntyre, B., & Seligmann, D. (1992, May). Annotating the real world with knowledge-based graphics on a see-through head-mounted display. In proceedings of Graphics Interface (Vol. 92, pp. 78–85).